LEARN — Students at the March 31 event heard from Ken Tanabe about interracial marriage laws in Virginia. 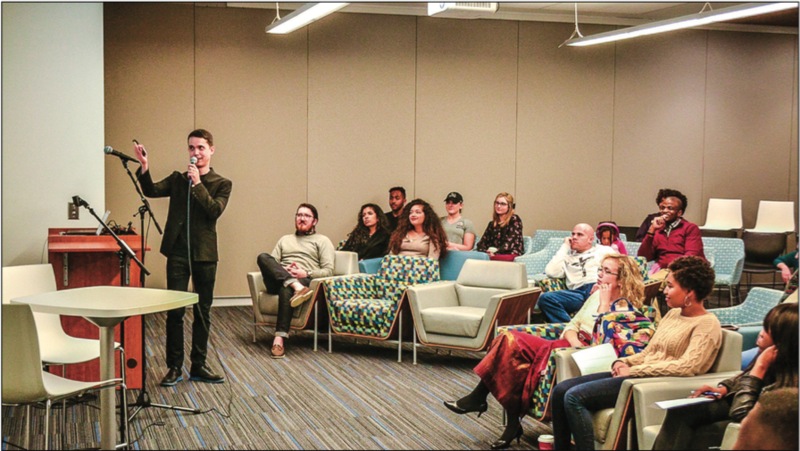 Liberty University’s Center for Multicultural Enrichment (Center4ME) expanded the initiative, Because it Matters, through an event focused on interracial relationships March 31. “Is Virginia Really for Lovers?” is an event that stems from the national “Loving Day” event that is celebrated each year June 12. Ken Tanabe is the founder of “Loving Day” and travels to many conferences and events to speak on the subject. Allen Ancheril, associate director of campus relations at the Center4ME, has attended conferences where Tanabe was a featured speaker and believed his information aligned perfectly with their initiative. “The Because it Matters campaign is working to promote cultural harmony and foster a cohesive campus community through programming focused on racial wellness,” Ancheril said. “Loving Day” was created by Tanabe when he discovered the U.S. Supreme Court Decision Loving v. Virginia which occurred in 1967. This decision disposed of all laws prohibiting interracial marriages. He wanted to help educate others about this important case and celebrate the multicultural community. “All of Center4ME’s programming focuses on being intentional about one’s personal efforts to explore, appreciate and understand the complex difference of others,” Ancheril said. Part of the mission statement of the Center4ME focuses on being sensitive to the needs of others and Ancheril believes this event is a representation of this. Through creating a dialogue and awareness of different racial issues, the students can become better equipped when presented with similar situations. The “Loving Day” event was founded to provide others with education of the history behind these relationships. Education is the necessary part of promoting tolerance, awareness and understanding, according to the official Loving Day website. According to Ancheril, the goal of this event is to create an experiential learning opportunity for the student body. “Today many of us may take our relationships for granted but people have fought for the right to love people who were different than they were,” Ancheril said. Ancheril hopes that participants of the event will take away a better understanding of interracial relationships and the joys and struggles of those who worked to gain freedom. He believes that those who are currently in these relationships will learn some of the dynamics that surround their lives. The Center4ME plans on creating more events that are similar to this one for the future years, according to Ancheril. A growing campus creates a need for more diverse programs like the ones that fall under the Because it Matters initiative. “There is an increase of interracial relationships on Liberty’s campus,” Ancheril said. With events like this one, Ancheril hopes to satisfy the needs of the students who are facing these challenges. He says the Center4ME will continue to provide students the opportunity to dive deeper and learn more about current issues regarding differing cultures. For more information on the Center4ME, visit their offices in Montview 2500 and 2560 or email them at Center4ME@liberty.edu.